n 1803, the Newfoundland Regiment of Fencible Infantry was raised as a result of war being declared between Great Britain and France. 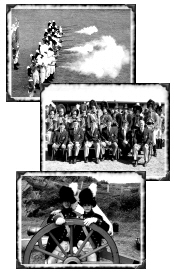 The Regiment remained in garrison until June 1805, when it was transferred to Halifax while a smaller detachment of Nova Scotia Fencibles was in turn sent to St.John’s. The Commanding Officer of troops in Newfoundland, Major General Skerrett, was concerned about the reduction of the garrison and suggested to Governor, Sir Erasmus Gower, that a volunteer force of rifleman be raised who could not only participate in defence but also act as auxiliary policeman and local militia. The Governor forwarded the request to His Majesty’s Secretary of State in London but decided to proceed with plans despite not having received a reply. 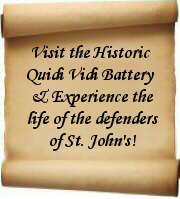 By the fall of 1805 nearly 200 men had been raised for the Loyal Volunteers of St.John’s as the unit was named. The men of the Corps were required to appear for foot and arms drill twice a week. The officers were selected by popular vote among the volunteers. Further, the Governor declared that no man in the volunteers could be pressed for service in the Royal Navy which no doubt hastened recruiting activity. By the fall of 1806 the Corp consisted of five companies numbering nearly three hundred men. All of the unit officers had received their commissions and the Governor, after administering the Oath of Allegiance, presented the unit with the King’s and Regimental Colors. Initially commanded by Captain Nathan Parker, the unit came under the command of his successor, James Macbraire, a wealthy St.John’s merchant in October 1808. Macbraire had held a Captain’s commission in His Majesty’s Royal Newfoundland Regiment of Foot that had been disbanded in 1802. The corps continued to experience trouble in preparing the troops as many of them were fisherman who returned to their profession with the coming of spring. Despite repeated attempts to alter schedules of drills, parades and exercises the unit’s efficiency declined to the point that the new Governor Sir J.T.Duckworth threatened their demise. All of this changed with news in 1812 of an Anglo-American war. 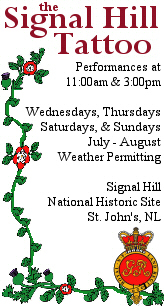 St.John’s was immediately placed on a war footing and the Loyal Volunteers of St.John’s were given a new lease on life. The Commanding Officer, JamesMacbraire, was promoted to Major and two additional companies were recruited to bring the total to 500 men. The reorganized unit was to be henceforth called the Saint John’s Volunteer Rangers and consist of ten companies. The officers and men were entitled to the same pay and rations as garrison officers on the days designated for duty. Through extensive efforts the corps finally proved to be fully clothed, well armed and professionally trained. Despite the best efforts of the officers and NCO’s the problem of recruiting continued to plague the Rangers. By 1813 near half of the unit were absent to the fisheries. Additionally recruiting parties from the Nova Scotia, New Brunswick and Royal Newfoundland Regiment had recruiting parties scouring the Island making it near impossible for the Rangers to attract new recruits. The arrival of the new Governor, Vice Admiral Sir R.G. Keats in June 1813, led to the ultimate demise of the Saint John’s Volunteer Rangers. Unable to get financial or logistical support for the unit from the War Office Keats decided to suspend the payment of the Volunteer Rangers effective 24 July, 1814. Further he instructed that all arms, drums, and other military stores be returned to the Major General Commanding. In response to that order Major Macbraire impressed upon the Governor that the weak state of the Volunteer Rangers was due entirely to the lucrative fishing industry and not to any lack of loyalty or patriotism on the part of the volunteers themselves.